The winners of the 2017 Teaching Excellence Awards in Mathematical Sciences are Min Hyung Cho and Theresa Schille. Min Hyung Cho (Ph. D. UNC Charlotte 2005) is completing his second year at UML. He teaches a variety of graduate and undergraduate courses. 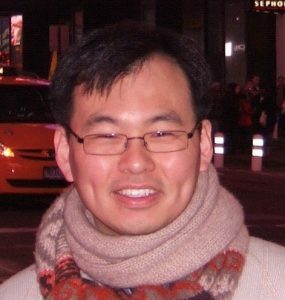 His research focuses on developing fast computational algorithms for wave scattering such as Maxwell’s equations and Helmholtz equation. Theresa Schille (B. S. UMass Lowell, 1992, M. S. UMass Lowell 1994) is completing her sixth year as a Lecturer in the Mathematical Sciences. She has taught calculus and precalculus courses in the day, evening and industrial settings. Congratulations to both Min Hyung and Theresa on this well-deserved honor!